Below are some of Millo’s seminars. Choose which one fits your company best and contact Millo to speak to your staff or at one of your events. 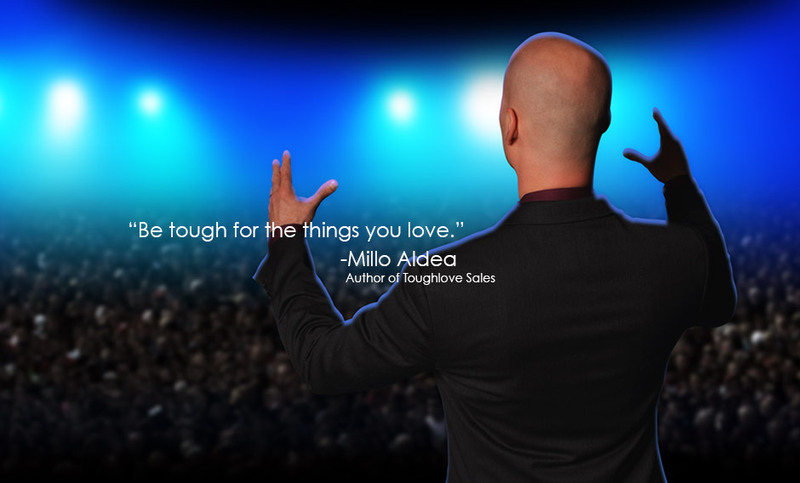 Millo also addresses customized sales & strategies, action taking and motivational seminars for your company. If you wish to have Millo teach your company the current trends of branding, sales and contagious behavior, click on the FACE2FACE tab to schedule a seminar in your city. The key to overcoming objections lies not on the asnwers that you give, but on the questions that you ask. Questions are also the difference between a presentation and a conversation. This seminar teaches the steps you must take to make an engaging presentation and prevent objections from happening. From having a positive attitude, contagious behavior, product knowledge, deliver persuading language, value propositions, negotiation skills and great care for customers, to knowing what to say and how to respond when prospects object to buy. Overcoming Objections is one of the most difficult skills to perfect, but with Millo, you and your employees can feel confident that you will improve the number of sales and enjoy the feeling of a larger bank account. Street Play is a seminar on how to expand your business contacts at networking events and social events. Street Play offers you the step by step process of a proven, extremely contagious approach towards people you don’t know in order to start building strong relationships, increase leads and make sales. The art of “Street Play” is one of seamless integration between friendliness and sales techniques to feel as if a sales contact was never made, but in fact, expanding your network and making solid connections. Street Play will enable you to bring out the uncontrollable desire to meet new people and at the same time discover the networking specialist in you. This seminar is a must for anyone that is having trouble meeting new people and lacking new prospects. To become the best product anyone has ever laid their eyes upon, one must understand all the aspects of “health success”. During this seminar Millo speaks on higher levels of Mental health, Physical health, Financial health, Social health and Spiritual health in order to become beyond the person you think you can be. This seminar will develop yourself into an extremely contagious person and will enable you to earn everything you dream of. Millo focuses on this seminar the most, for it speaks to those who want more out of life than being average. Either you get with it or let your competition beat you to it. Social Media is part of business and for those who do not treat it like such, sales will diminish. Social Media is the current way and the future on how everyone is communicating “on-the-fly”, and how businesses can connect with customers on a personal note all over the world. With over 13 years of experience in branding, web development and building social media campaigns for companies, Millo’s Cyber Presence Seminar teaches the necessary steps to build your social media presence and make your competitors look like amateurs. Necessary for anyone that knows the power of social media and wants to increase the awareness of their brand. The Scheme is an hour seminar that describes the differences, pros and cons of Network Marketing vs Corporate Marketing. During The Scheme the audience will understand why Corporate Employees and Executives tend to “bad-mouth” Network Marketing, and why Professional Network Marketers do the same towards Corporate jobs. This Seminar is to encourage professionals to become entrepreneurs and better salesmen, regardless of where their professional career might take them, and what actions it will take to make it happen. Perfect for Network Marketing training seminars and sales professionals.